We have been farming in Eastern Europe and the U.S. for over 25 years. Over that period, we grew our farming operation to 26,000 acres. We have conducted countless tests of biological seed treatment inoculants over the years and nothing has excited us more or performed better than our unique combination blend of beneficial crop specific bacteria, fungi, micro-nutrients, bio-stimulants, and featured mycorrhizal fungi with our row crops. As a matter of fact, most of the biological seed treatment products currently being offered in the U.S. have been in our fields and tested. We know what works and what doesn’t. We also know the strengths and weaknesses of various active ingredients. Interestingly enough, some of the active ingredients found in MycoGold are sold by other companies individually as “Stand Alone” products. This is one of the many reasons why MycoGold® is the “Complete Package” biological seed treatment Arsenal. Our team of farm managers, agronomists, and crop consultants are confident that this will be the next generation natural bio-inoculant for row crop farmers. We have developed MycoGold to help farmers increase yields and improve soil biology all while reducing other input costs. We are way ahead of the curve when it comes to farming with biological input products as it is more common in Eastern Europe than in the United States. We are very excited to get this in the hands of U.S. farmers. A common complaint that we often hear from farmers, and frankly had ourselves, is that many of biological products currently available are inconsistent in performance year to year. You may get yield increases one year and a zero the next year. We have experienced these types of results ourselves(remember above mentioned testing), and have solved this problem with the MycoGold line of biological inoculants. Our product delivers a positive ROI year after year. We don’t like “break even” products and I believe our sentiments are shared in that regard. Through various testing we have developed the perfect blend of high propagule count mycorrhizae, beauveria bassiana, crop specific beneficial bacteria, micro-nutrients, and a bio-stimulant package. We have combined these biological organisms with a talc carrier that make the Ultimate and most complete biological seed treatment arsenal available today. Farmers are starting to take notice of the amazing benefits of biological inoculants and the results don't lie. 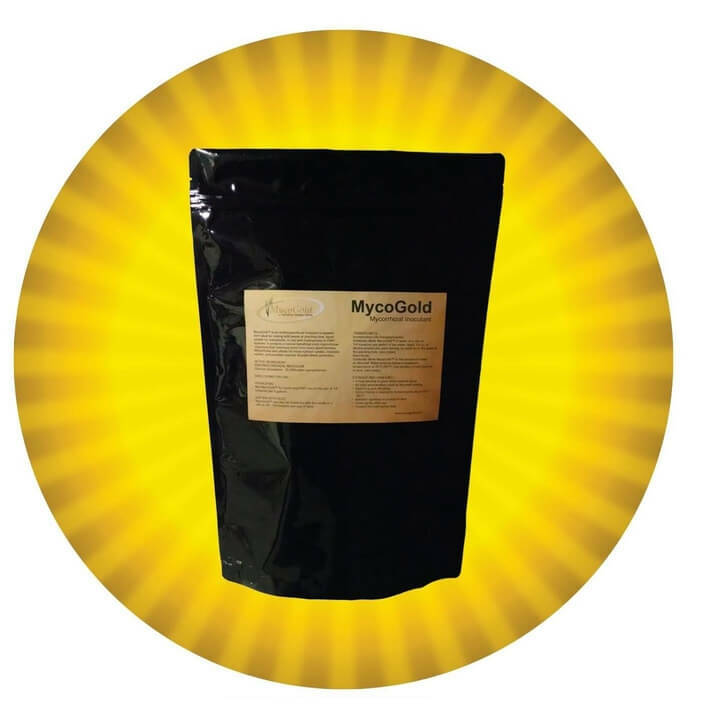 MycoGold® works like a bio fertilizer and also allows the plant to utilize more of applied fertilizer, so it allows you to save money on your fertilizer program without compromise. Whether you grow soybeans, corn, peanuts, cotton, or wheat, if you are interested in exploring a real performing biological seed treatment, then look no further than MycoGold. “We know more about the movement of celestial bodies than about the soil underfoot,” said Leonardo da Vinci. Modern scientists say that remains the case today. But we are starting to get a glimpse into that world. One of the most recent discoveries revolves around something called mycorrhizae. These are filaments of fungus that grow on plant roots. These fungi act as extensions to a plant’s root network, allowing it to draw nutrients from a much larger area. That in itself is amazing—plant and fungus working together to their mutual benefit. But last summer, researchers from the UK found that these mycorrhizae link up, creating a sort of underground Internet, connecting different plants together. Perhaps a telegraph system would be a better analogy. The researchers found that when one plant was attacked by aphids, it would send a signal through the mycorrhizal filaments warning the other plants. These plants would have an early warning to go into defense mode, producing chemicals to repel aphids and even call for reinforcements by secreting a chemical designed to attract wasps, which eat aphids. The mycorrhizae help plants defend against disease in the same way, with sick plants using the network to get out an early warning. All this is from just one type of fungus. Yet dirt holds many more potential wonders. By improving nutrient uptake and soil biology, MycoGold supports plant growth leading to yield increases. Since MycoGold supports improved water uptake from the soil, they strengthen plants in drought periods. This is a high importance in times of increasingly extreme climate conditions.